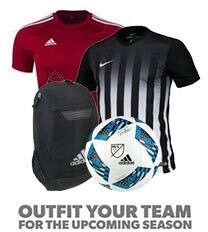 Does your club order team uniforms and apparel online? Angelo's Order System eliminates 80% of the work associated the ordering process. managers the ability to oversee the process from beginning to end. 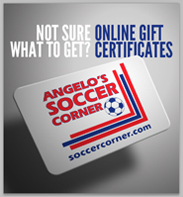 Does your club earn rewards for team purchases? promotional packages from all major brands. Does your club work with a dedicated team specialist? An experienced and knowledgeable team specialist will meet with you throughout the year to assist in the planning, execution and delivery of uniforms, equipment and spiritwear. Do you want to improve your club identity? Your dedicated team specialist will work with you to identify all options available within the industry to create an identity unique to your club and ensure that you stand out in a crowd. From humble beginnings of selling Copa Mundials within a 600 square foot space in the late 1980's we have always been focused on the customer and the game. Today we are the largest soccer specialty retailer in the Mid-Atlantic Region and one of the top retailers and soccer team dealers in the United States. We are well over 100 soccer loving men and women who are focused on providing excellent service whether fitting your son or daughter with new shoes or applying the logo to your club's uniform. We are a soccer company working with soccer people every day all year around. We were twice awarded Best Soccer Store in America by USSOCCER/Soccer America and have been the Philadelphia Union's merchandising partner since its inception into the MLS in 2010. We run a state of the art 30,000 SQFT production facility with on-site printing, embroidery and heat pressing, enabling us to control the environment of producing high quality soccer products for players, coaches and fans! Team specialists are available by phone or email but would be glad to meet you in person.